Are you making the connection between the foods you eat and the symptoms you have? Do you have heartburn, GI distress, headaches, migraines, sleep issues, pain or muscle cramping to name a few? These can all be attributed to the foods we eat. Will the doctor suggest this? Most will not – they have a pill you can take! But most symptoms can be directly related to the foods we eat. When I work with clients, I am not telling them what to eat, I am giving them an experiment to complete. See what happens if you eat this vs that. They already know that they do not feel well many times when they come in to see me. They already know how they are eating now makes them feel – grumpy, moody, sick and lethargic. I make suggestions to try other foods in place of what they are used to. I help them make the connection between the foods and the symptoms. I help them find new foods they might have never heard of. And this is also the fun part. New foods! Yeah. 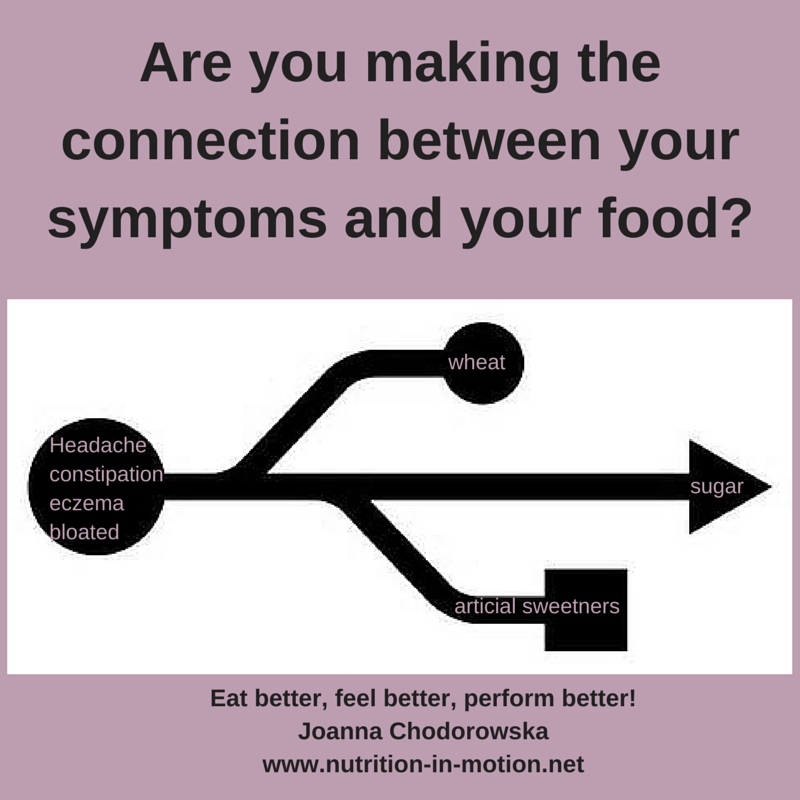 Are you making the connection between your foods and your symptoms? what to look for. My clients usually do not. I suggest the aggravating foods to be eliminated. I may ask you to avoid wheat for 2 weeks – 2 months before you reintroduce it. Wheat tends to be a grain that is inflammatory – to the gut as well as the whole digestive system. I use Nutrition Response Testing to confirm a wheat or food sensitivity, but I also test other grains to make sure going to non-wheat grains won’t cause similar issues. For me, brown rice is more inflammatory than wheat! Who knew? My clients like that I give them recipes and suggestions of what else they CAN eat. When I worked with a nutritionist 20 years ago, she gave me a list of what I could not eat…..but then I had no idea what I could eat and I was miserable! (I also craved all the foods on that list of foods to avoid. smh) So I promised not to do that when I started my nutrition coaching practice. I try to make it easier for you. Why waste time trying to figure it out, or suffer in the process? Making the connection to the aggravating food, then you can also try to see how much can you get away with without getting any symptoms. If you love bagels, but wheat is a problem, maybe half will be enough? Maybe 1/4 of a bagel will be enough to set off symptoms (but who wants just 1/4 of a bagel? Or can eat only 1/4?). This is part of the experiment. For me, wheat is a problem. I get headaches, I get a sour stomach, I get indigestion, I get constipated, I get tired, stiffness in all my joints and have a hangover the next day. I really do not like these symptoms. And I found out from dinner 2 years ago, that I cannot have a beer or two (wheat based), a slice of crusty bread with olive oil and spices and feel good the next day! It took me almost until 4 PM the next day to feel like myself again flushing my system with lemon water, Green Monster juices and eating greens all day. I now know that I can have half the slice of crusty bread or the beer, but not both. I am actually scared now to drink a beer! Yes, scared. Making the connection between the food and your symptoms changes your life for the better. Yes, you have some food restrictions and may have to plan meals out a bit better than you did before. But you will feel vibrant, alive and able to sleep better and function more clearly through the day. My job is done when you make the connection. The rest is up to you as only you will know if it is worth eating the offending food or not. For me, a really good brownie is worth it, but a bagel or pizza slice is not.